It's Liu Xiaobo's birthday today and the 2010 Nobel Peace Prize laureate is still in a Chinese jail. Re-read his love poem to his wife: 'You Wait for Me With Dust'. 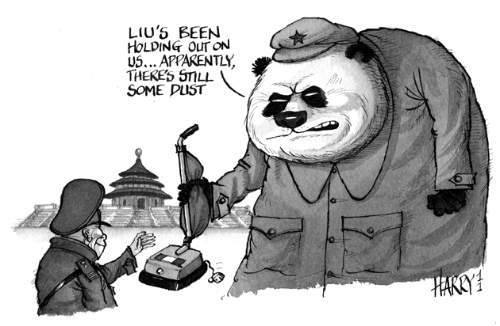 In this special cartoon for Liu and the ALR, cartoonist Harry Harrison comments bitingly on the Chinese government's determination to intrude on even the most private moments of suffering. Today, the 28th December, is Liu Xiaobo's birthday and there seems to be no prospect either of his release or of an end to the indefinite house arrest of his wife, Liu Xia, who remains isolated without charge. Today is Liu Xiaobo's birthday. Think of him, read Charter 08 and read or listen to the poem he wrote to his wife, Liu Xia: 'You Wait for Me With Dust'. Write to Liu Xiaobo at all the addresses here, or send him a birthday card at the Chinese Embassy, 49-51 Portland Place London W1B 1JL and ask the Ambassador, the similarly-named Mr. Liu Xiaoming, to send it on. Or give the man a call on +442072994049 and ask to be put through to Liu Xiaobo. Every day for Liu Xiaobo is a further gathering of suffocating dust and the continued incarceration of a Nobel laureate gathers the dusk of the world's indifference and increases the shame of us all. The brutal silencing of his mild and peaceful voice represents the stifling of debate, of discussion and of basic freedoms that oppress so many round this world. Liu, Ai Wei Wei and other prominent dissidents represent the millions of others whose individual oppression goes unreported and unremarked. On this day when we celebrate the death of a tyrant in North Korea, mourning only the length of his dictatorship, let's turn the spotlight of world attention to illuminate the plight of a decent man whose only wish is that the world should be free to speak without fear. He speaks for us all, and we must speak for him. Let us not go into 2012 complicit in his imprisonment through our silence. Many thanks to Harry Harrison for his generous contribution to this piece.